The first method is kind of a pointy-clicky way of taking care of this. We need to actually enable a helper module. So go ahead and click on the Modules button in your Admin toolbar. and make sure that is enabled. So you click the checkbox and Save configuration. where we can easily install a new module. a link here at the top that says, Install new module. In this video we walk through two methods for downloading and installing new modules. 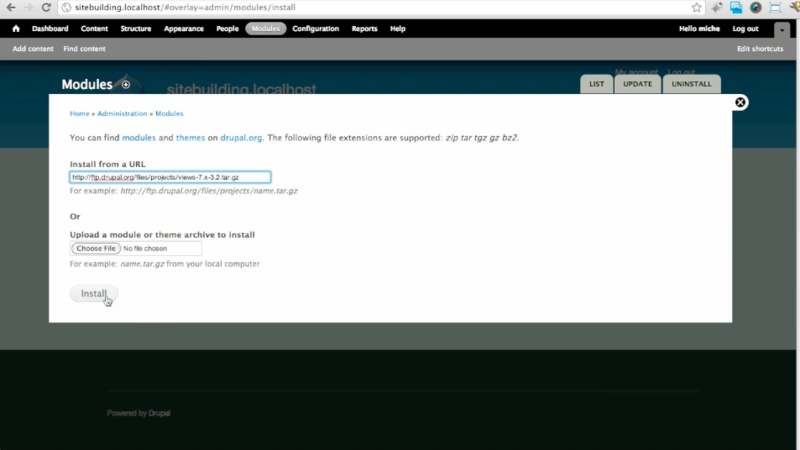 First we use the administrative interface on our site to install a new module with a URL, and then we download a module directly from Drupal.org and place the files in the proper location in our Drupal files. We also talk about some best practices for organizing your modules in your file system.